It is no mere coincidence that climate deniers maintain the "right" to unlimited fossil-fuels consumption. So it's understandable that their refusal to acknowledge any responsibility toward the natural environment starts to "inform" their views on climate. Similarly, those with an economic incentive to cut down the dwindling ancient forests wish to believe that the forest will grow back, or that there are still plenty of trees somewhere. Yet, despite the denialists and the apathetic -- the effect is the same -- there are sometimes common denominators and common sense that get us beyond stalemate. For example, saving money by growing one's own food, planting some trees for shade and beauty, and trying to impress a love-interest by holding an actual book instead of fiddling with a small "entropy screen," do not require consensus on climate change and its causes. This flier is ready for your use. Click on it below to Save or Share, in order to print it out. But see if you can get some "waste paper" (used on just one side) or get some 100% post-consumer-waste paper, or tree-free paper. You owe it to yourself (and future generations, and all other species) to experiment: put up the flier where people will see it, and try to gauge public reaction. It will help if you put your contact information at the bottom. If it works, you may want to expand the experiment. 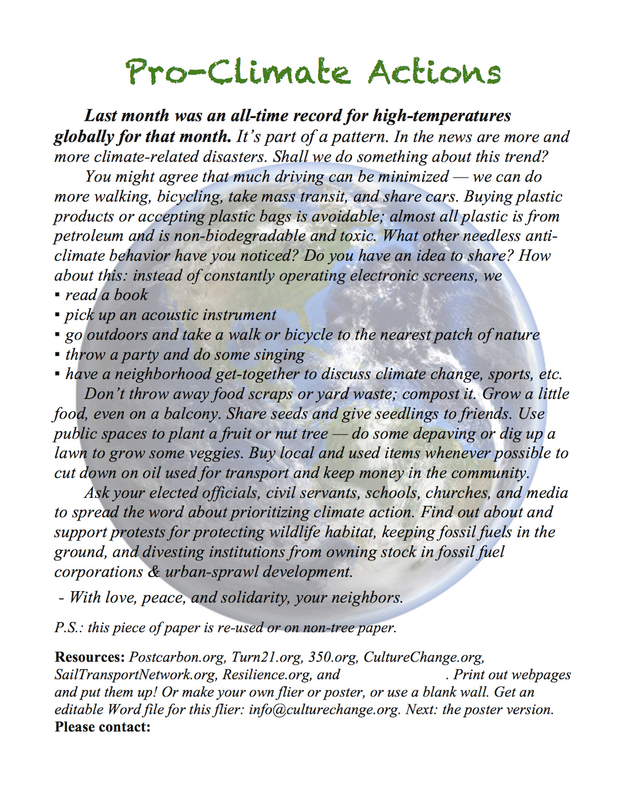 You may have some children who would consider it fun and environmentally cool to go out and put up the flier around the community. Please let us know what you think, and what results you may have. Are you ready for the poster version, a large, attention getting crowd-pleaser? If you can do a better flier or poster, do so by all means! Thanks! Scroll down for the full 8 1/2 x 11 inch graphic to print it; you may need to save it in your computer's Pictures or Photos file. And don't forget to see the Further Reading section below for some inspiring, definitive information! Print it out and fill in some contact information if you would. Add a website-resource. And put the flier up! 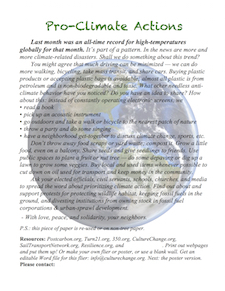 Pledge for Climate Protection (from 2000) which has details on ten key steps for dealing with both the climate and petroleum dependence. 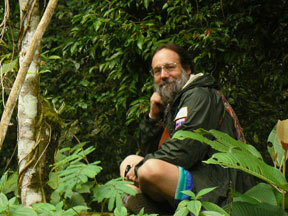 Global Warming Culture versus the Natural Future for Humanity, and the Real Denialism: In Albert Bates' 2010 book The Biochar Solution he calculated that if everyone in the world planted one tree per day, in a matter of months the excess CO2 from the atmosphere would be removed and put back into the ground. Bates told Culture Change on May 1, 2014, "If there is a glimmer of hope, it lies in soil and what we can do to assist accelerated photosynthesis." Oh, but what about a technofix so our huge population can keep consuming? Read Time to Stop Worshipping Economic Growth which warned in its introduction "...environmental organizations and 'green' leaders put the economy first in their climate protection priorities: relying almost entirely on a technofix for an eventual 'clean energy economy' through financing different industries than fossil fuels. Meanwhile, immediate curtailment of energy consumption is far quicker and more effective. We must counteract the inadvertent guardians of the status quo. - J L"
What did the Our Renewable Future team find? This new book, by Richard Heinberg and David Fridley, of Post Carbon Institute, offered this scenario in Heinberg's June 13, 2016 emailed article Tiptoeing Through the Renewable Energy Minefield: "[W]hile renewable energy can indeed power industrial societies, there is probably no credible future scenario in which humanity will maintain current levels of energy use (on either a per capita or total basis). Therefore current levels of resource extraction, industrial production, and consumption are unlikely to be sustained—much less can they perpetually grow. Further, getting to an optimal all-renewable energy future will require hard work, investment, adaptation, and innovation on a nearly unprecedented scale. We will be changing more than our energy sources; we’ll be transforming both the ways we use energy and the amounts we use. Our ultimate success will depend on our ability to dramatically reduce energy demand in industrialized nations, shorten supply chains, electrify as much usage as possible, and adapt to economic stasis at a lower overall level of energy and materials throughput." Question? 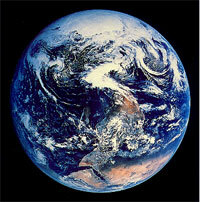 Are we turning Earth into Mars or Venus? The surface of Venus is hidden by an opaque layer of clouds which are formed from sulphuric acid. Mars is a planet with a thin atmosphere composed primarily of carbon dioxide. Maybe a runaway greenhouse effect on Earth will emulate Venus'.